National parks are very rarely within a city, and yet Bukhansan Mountain was designated as a the 15th national park of Korea in 1983. With an area of 79.9㎢, it stretches over Seoul and Gyeonggi-do. 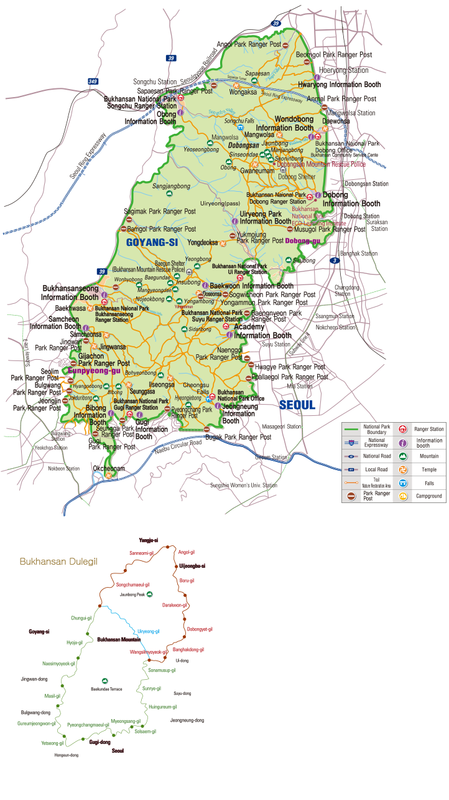 Bukhansan National Park is divided into two areas with Uiryeong Pass in the middle: Bukhansan Mountain to the south from the pass, and Dobongsan Mountain to the north. The national park is like an ecological island because it’s totally surrounded by urban areas, but it still serves as green lungs for the urban environment. It’s a popular natural park for over 20 million residents within the vicinity. It’s accessible from anywhere in the Metropolitan area thanks to the great road system. With around five million visitors each year, it’s listed in the Guinness Book of World Records as the “Most Visited National Park per Unit Area”. However, having too many visitors has gradually weakened the ecosystem of Bukhansan Mountain. Therefore visitors are strongly recommended to voluntarily follow the regulations on the Rest-Year Sabbatical System, Restricted Access during the Mountain Fire Watch Period, Accidents on Narrow Trails, Dangerous Areas, and other access restriction. Bukhansan National Park has dozens of gorges and granite peaks with crystal clear streams flowing between them, creating a beautiful harmony between mountain and water. There are more than 1,300 species of flora and fauna. There are also many historical and cultural sites including Bukhansanseong Fortress with over 2,000 years of history, over 100 Buddhist temples and monk’s cells. In short, it’s a great place of learning in terms of ecology, culture, and history.